Mast cells play a crucial role at the early stages of immune response against bacteria and parasites where their functionality is based on their capability of releasing highly bioactive compounds, among them TNF. Mast cells are considered the only cells storing preformed TNF, which allows for the immediate release of this cytokine upon contact with pathogens. We approached the question of mechanisms and amino acid motifs directing newly synthesized TNF for storage in cytoplasmic granules by analyzing the trafficking of a series of TNF-enhanced GFP fusion proteins in human mast cell lines HMC-1 and LAD2. Protein covering the full TNF sequence was successfully sorted into secretory granules in a process involving transient exposure on the outer membrane and re-endocytosis. In human cells, contrary to results previously obtained in a rodent model, TNF seems not to be glycosylated and, thus, trafficking is carbohydrate independent. In an effort to localize the amino acid motif responsible for granule targeting, we constructed additional fusion proteins and analyzed their trafficking, concluding that granule-targeting sequences are localized in the mature chain of TNF and that the cytoplasmic tail is expendable for endocytotic sorting of this cytokine, thus excluding direct interactions with intracellular adaptor proteins. Mast cells are an important element of both innate and acquired immunity. Upon appropriate stimulation, cells undergo activation and subsequent degranulation, releasing and synthesizing highly bioactive, proinflammatory, vasodilative, chemotactic, and cytotoxic substances. One class of mast cell mediators are cytokines, among them TNF. As shown in a model of bacteria-induced inflammation, deprivation of the mast cell-derived pool of TNF leads to a significantly reduced influx of neutrophils and increased mortality (1, 2). In addition, in the reverse Arthus reaction animal model, the critical importance of mast cell-derived TNF was ascertained (3, 4). The important role of mast cells as a source of TNF may be explained by their unique capability of storing preformed cytokine in cytoplasmic granules, which allows for its immediate release upon stimulation (5, 6). Several hours after initial stimulation and degranulation-related release of TNF, mast cells synthesize and release additional amounts of TNF by direct vesicular transport from Golgi apparatus to the plasma membrane (7, 8). The mechanism of TNF trafficking has been studied in macrophages, revealing that TNF is synthesized as a 26-kDa transmembrane precursor protein and later on proteolytically processed to a 17-kDa soluble form (sTNF).3 Conversion of transmembrane precursor protein TNF into sTNF takes place en route from the endoplasmic reticulum (ER) to the plasma membrane (9) and is catalyzed by TNF-converting enzyme (TACE/ADAM17). The mechanisms regulating TNF trafficking in mast cells have not been studied extensively. Particularly little is known about the nature of the switch directing TNF protein either into cytoplasmic granules or directly to the cell membrane, which might depend on the cellular activation status. We have shown previously (10) that, in rodent mast cells, TNF sorting to cytoplasmic granules largely depends on N-linked glycosylation and a mannose-6-phosphate receptor-based system. Although major pieces of evidence for specific biological function of TNF stored in mast cell granules come from a rodent model, the existence of a similar pool of this cytokine in many subsets of human mast cells has been reported (11, 12, 13). There is a growing body of evidence that human mast cell-derived TNF plays a critical role in certain physiological and pathological processes, including vascular diseases (14, 15), host defense (16), tissue remodeling (17, 18), and various chronic inflammatory states (19, 20, 21). Both the pleiotropic nature of TNF and its potential as a drug target prompted us to explore the mechanisms of trafficking of this cytokine into cytoplasmic granules in human mast cells. Analysis of the amino acid sequence of human TNF reveals that the N86 asparagine residue that is glycosylated in rodents is replaced by threonine and, thus, no N-linked glycosylation, important for trafficking of this molecule in rodent mast cells, is possible. In this work, we provide evidence for the existence of specific ER entry and cytoplasmic granules targeting motifs in human TNF and show that, in human mast cells, a fusion protein composed of full-length TNF fused to enhanced GFP (EGFP) on its way to cytoplasmic granules is transiently exposed on the outer membrane. The DNA fragment encoding human TNF was obtained by RT-PCR. In brief, 5 μg of total human RNA (isolated from the HMC-1 cell line) was subjected to reverse transcription reaction using Moloney murine leukemia virus reverse transcriptase (Invitrogen Life Technologies) and random hexamer oligonucleotides in a final volume of 20 μl. cDNA was amplified using AccuTaq polymerase (Sigma-Aldrich) and GGAAAGGACACCATGAGCACTG and GTCCTCCTCACAGGGCAATGAT oligonucleotides (all oligonucleotide sequences are given in 5′ to 3′ direction). The product of PCR was cloned into pT-Adv plasmid (Clontech Laboratories), resulting in plasmid pTA-hTNF. pTA-hTNF was sequenced to verify the integrity of the TNF reading frame. To obtain plasmids encoding for fusion proteins consisting of 1–234, 1–76, 77–234 fragments of TNF and EGFP respective fragments of the TNF open reading frame (ORF) were PCR amplified from pTA-hTNF using Pvu polymerase (MBI Fermentas), digested with the indicated restriction enzymes (recognition sequences in bold), and in-frame cloned into pEGFP-N1, pECFP-N1 (enhanced cyan fluorescent protein), and pEYFP-N1 (enhanced yellow fluorescent protein) plasmids (Clontech Laboratories) digested with XhoI and AgeI. The following forward/reverse oligonucleotide pairs were used: TATACTCGAGATGAGCACTGAAAGCATGATCCGGG/TGACCGGTAATTCGGCTGGTCCTCCTACCAG (1–234, XhoI/AgeI), TATACTCGAGATGAGCACTGAAAGCATGATCCGGG/ATGACCGGTGGGATTCCAGGACATAATCTGACTG (1–76, XhoI/AgeI), and GTCACTCGAGATGGTCAGATCATCTTCTCGAACCCCG/TGA CCGGTAATTCGGCTGGTCCTCCTACCAG (77–234, XhoI/AgeI). Resulting plasmids were named p1–234, p1–76, and p77–234hTNF-ECFP (EGFP/EYFP), respectively, and sequenced to confirm the integrity of the fusion proteins’ ORFs. To prepare p21–234hTNF-EYFP and p46–234hTNF-EYFP, corresponding fragments of the fusion reading frame were amplified from p1–234hTNF-EYFP, digested with the indicated restriction enzymes (recognition sequences in bold), and ligated into XhoI/NotI-digested pEYFP-N1 (4-kbp fragment). The following forward/reverse oligonucleotide pairs were used: CTGCTCGAGGAGGCGCTCCCCA AGATGACA/AGTCGCGGCCGCTTTACTTGTACAGCTCGTCC (21-234, XhoI/NotI) and CTGCTCGAGGCAGGCGCCACCATGCTCTTC/AGTCGCGGCCGCTTTACTTGTACAGCTCGTCC (46–234, XhoI/NotI). Resulting plasmids were sequenced to confirm the integrity of the fusion proteins’ ORFs. The human mast cell line HMC-1 (22) was a gift from Dr. J. Butterfield (Mayo Clinic, Rochester, MN). Cells were maintained in Iscove’s medium supplemented with 10% heat-inactivated FBS and 2 mM glutamine. At the density of ∼1.5 × 106 cells/ml, cells were diluted to 0.4 × 106 cells/ml. Cells were grown in 5% CO2 at 37°C in a fully humidified atmosphere. All medium components were purchased from Sigma-Aldrich. LAD2 cells (23) were a gift from Dr. A. S. Kirshenbaum (National Institutes of Health, Bethesda, MD). Cells were cultured in serum-free medium (StemPro-34; Invitrogen Life Technologies) supplemented with 2 mM l-glutamine, 100 IU/ml penicillin, 50 μg/ml streptomycin (complete serum-free medium), and 100 ng/ml recombinant human stem cell factor. For transfection, 25–50 μg DNA was added to 2–10 × 106 (HMC-1) or 5 × 105 (LAD2) cells in 400 μl of culture medium and electroporated in a Gene Pulser II (Bio-Rad) at 250 V (HMC-1) or 300 V (LAD2), 950 μF. Immediately following transfection, cells were diluted to 5 × 105 cells/ml in fresh medium. For TNF release/inhibitor studies, cells were incubated, where applicable, with 20 μM cycloheximide (CHX) applied 60 min before stimulation. For stimulation, 1 μM ionomycin and 100 ng/ml PMA were added for the indicated time. Cell suspension density was adjusted to 1 × 106 cells/ml. Viability of the cells subjected to concentrations of CHX used in the experiments was assessed by annexinV-PE/7-aminoactinomycin D staining and established as >90%. Noninhibited cells exhibited 95% viability. TNF ELISA was performed using a commercial kit (Sanquin) according to the manufacturer’s instructions. For SDS-PAGE, cells were collected and lysed in 0.2% Triton X-100 supplemented with protease inhibitor mixture (Roche) and 1 mM PMSF. For deglycosylation analysis, cell lysate containing 10 μg total protein was treated with neuraminidase (New England Biolabs) according to the manufacturer’s instructions. For fusion protein expression analysis, 10 μg of total lysate was loaded per lane of gel. Samples were resolved on 8 or 10% polyacrylamide gels under denaturing conditions. Following electrophoresis, proteins were transferred to a Hybond N membrane (Amersham Biosciences) in wet blotter (Bio-Rad) at 400 mA for 60 min. Western blotting was conducted according to standard procedures using mouse monoclonal anti-GFP (Roche) and HRP-conjugated goat anti-mouse (DakoCytomation) Abs or goat anti-TNF and HRP-conjugated donkey anti-goat Abs (both from Santa Cruz Biotechnology). Chemiluminescent detection was performed using an ECL kit (Amersham Biosciences) according to the manufacturer’s protocol. HMC-1 cells were transfected with p1–234hTNF-EGFP and 12-h posttransfection cell surface proteins were biotinylated with EZ-Link Sulfo-NHS-LC-Biotin (Pierce) according to the manufacturer’s instructions. Immediately after labeling or after the indicated chase period, cells were fractionated as described with minor modifications (24). In brief, 5–10 × 107 cells were suspended in 2 ml of 0.34 M sucrose, 5 mM HEPES (pH 7.3), 0.5 mM EDTA, and 1 mM PMSF (supplemented with a mixture of protease inhibitors), and disrupted by 20 passages through a 21-gauge needle. Unbroken cells and nuclei were removed by centrifugation for 10 min at 700 × g. Six milliliters of 20% Percoll in 15 mM HEPES (pH 7.4)/0.25 M sucrose was layered onto the top of a 1-ml cushion of saturated sucrose. The 700 × g supernatant of the cell homogenate was layered onto the top of the Percoll and centrifuged in a SS-34 rotor at 16.4 krpm (32,000 × g) for 45 min. Fractions (1 ml each) were collected from the bottom with a peristaltic pump. The β-hexosaminidase activity assay in collected fractions was performed by mixing 50 μl of 2 mM 4-nitrophenyl N-acetyl-β-d-glucosaminide (Sigma-Aldrich) in citrate buffer (pH 4.5) and 50 μl of each fraction diluted with the same buffer and incubating at 37°C for 60 min. Following incubation, 150 μl of 0.1 M carbonate buffer (pH 10) was added and absorbance was measured at 405 nm. Controls showing no influence of Percoll on β-hexosaminidase assay results were performed. For biotinylated proteins, distribution analysis fraction samples were diluted with PBS containing 0.1% Triton X-100 and protease inhibitors and incubated overnight at 4°C with streptavidin-Sepharose beads. The beads were washed five times with 0.5% Triton X-100 in PBS, boiled for 5 min in SDS-PAGE sample buffer, and analyzed by Western blot using anti-GFP Abs (Roche). For live imaging, HMC-1 cells were placed in LabTek-chambered coverslips (Nunc). For tryptase staining, cells were washed and resuspended in cold PBS and incubated on poly-l-lysine slides. Following adhesion, cells were washed with PBS and fixed in 4% formaldehyde and 0.1% glutaraldehyde/PBS. All further steps were performed in 0.05% saponin and 2.5% BSA/PBS. In brief, cells were incubated for 1 h at room temperature with 1/100 mouse monoclonal anti-human tryptase Abs (DakoCytomation). Following thorough washing, cells were incubated for 1 h at room temperature with 1/200 tetramethylrhodamine isothiocyanate-conjugated goat anti-mouse F(ab′)2 (Sigma-Aldrich) and washed. After the final wash, cells were mounted in 5 mg/ml 1,4-diazabicyclo[2.2.2]octane (Sigma-Aldrich) and Fluoromount G (Southern Biotechnology Associates). Confocal microscopy was performed on a Leica TCS SP2 AOBS microscope. Image processing was performed with the Leica Confocal software package. All monochrome images are presented in unprocessed form. For visualization purposes, color restoration in multicolor images was accompanied by linear adjustments of brightness and contrast. Predictions of O-linked glycosylation sites were performed using software hosted on the Center of Biological Sequence Analysis, Technical University of Denmark DTU (http://www.cbs.dtu.dk/services/). TNF protein sequence alignment was performed with Vector NTI software. Two-way ANOVA followed by the Holm-Sidak t test were used to determine statistical significance of observed differences. We have shown previously that in rodent mast cells, TNF delivery to mast cell granules largely depends on N-linked glycosylation (10). Phylogenetic protein sequence analysis showed, however, that the N-terminal region of sTNF is one of the least conserved and that the N-linked glycosylation motif NSS is unique to rodents and, in primates, is replaced by the RTP motif (Fig. 1⇓A). Sequence context-based prediction indicated that in human TNF T83 residue could be glycosylated (Fig. 1⇓B). To test this prediction, HMC-1 cells were transfected with p1–76hTNF-EGFP, p77–234hTNF-EGFP, or p1–234hTNF-EGFP and lysed 24 h after transfection. The former two were used as negative controls due to the lack of the glycosylation target motif and improper subcellular localization, respectively (see below). Lysates were treated with neuraminidase and analyzed by Western blot. Proteins of apparent molecular masses of 35, 46, and 54 kDa were detected in lysates of cells transfected with p1–76-, p77–234-, and p1–234hTNF-EGFP. Regardless of the lysate tested, the protein molecular mass did not change following neuraminidase treatment, which suggests that the protein is not sialylated (Fig. 1⇓C). To substantiate that result, HMC-1 cells were transfected with p1–234hTNF-EGFP and, following transfection, cultured in the presence of 2 mM benzyl 2-acetamido-2-deoxy-α-d-galactopyranoside, which serves as a competitive substrate for N-acetyl-β-d-glucosaminyltransferase and inhibits O-linked glycosylation (25). Twenty-four hours after transfection, cells were lysed; lysates were treated with neuraminidase and analyzed by Western blot. Regardless of benzyl 2-acetamido-2-deoxy-α-d-galactopyranoside and neuraminidase treatment in all lysates, a protein of apparent molecular mass of 54 kDa was detected (Fig. 1⇓D). Because the majority of O-linked carbohydrate chains contain sialic acid as a terminal residue, these results strongly suggest that in HMC-1 cells, TNF is not O-glycosylated. This is further supported by a good agreement between calculated and observed molecular mass of TNF expressed in HMC-1 cells. TNF glycosylation analysis. A, TNF sequences were compared across species showing evolution from N-glycosylation (N86 residue in rodents) to potential O-glycosylation (T83 in primates, ↑). B, Neural network prediction of O-glycosylation of human TNF. T83 residue, →. C, Western blot analysis of lysates of HMC-1 cells transfected with p1–76, p77–234, and p1–234hTNF-EGFP and treated with sialidase. D, Western blot analysis of lysates of HMC-1 cells transfected with p1–234hTNF-EGFP, cultured in the presence or absence of 2 mM benzyl 2-acetamido-2-deoxy-α-d-galactopyranoside and treated with sialidase. HMC-1 cells were transiently transfected with p1–76hTNF-EGFP, p77–234hTNF-EGFP, or p1–234hTNF-EGFP plasmids, and 24-h posttransfection, cell lysates were analyzed by Western blot (Fig. 2⇓, A and B). In lysates of p1–76hTNF-EGFP-transfected cells, a protein of an apparent molecular mass of 35 kDa could be detected using anti-GFP Abs, whereas no bands were detected with Abs directed against sTNF. In lysates of p77–234hTNF-EGFP-transfected cells, a protein of an apparent molecular mass of 46 kDa was detected with both anti-TNF and anti-GFP Abs. In lysates of p1–234hTNF-EGFP-transfected cells, a major band of apparent molecular mass of 54 kDa and minor bands of 46 and 56 kDa were detected. Thus, proper expression of TNF-EGFP fusion proteins has been confirmed, additionally revealing possible proteolytic processing and posttranslational modification of 1–234hTNF-EGFP (46- and 56-kDa bands, respectively). In parallel, green fluorescence patterns in HMC-1 cells transiently transfected with p1–76hTNF-EGFP, p77–234hTNF-EGFP, or p1–234hTNF-EGFP were analyzed by confocal microscopy at 3, 10, and 24 h posttransfection. At the early time point (3 h) in both p1–76- and p1–234hTNF-EGFP-transfected cells, fluorescence could be observed in a perinuclear organelle morphologically resembling Golgi apparatus, whereas in p77–234hTNF-EGFP-transfected cells, fluorescence was distributed rather evenly (data not shown) and the distribution of 77–234hTNF-EGFP did not change for the whole observation period of 24 h posttransfection (Fig. 2⇓D). In contrast, 10 h posttransfection in p1–76- and p1–234hTNF-EGFP-transfected cells vesicular fluorescent structures could be observed (data not shown) and, after 24 h, the number of these structures had increased while fluorescence in Golgi-resembling structures had diminished, probably due to decreasing expression of a transgene in transient transfection (Fig. 2⇓, C and E). Thus, both propeptide (1–76) and full-length (1–234) TNF sequences, as opposed to soluble TNF (77–234), were shown to be capable of sorting EGFP into vesicular intracellular structures. Expression and intracellular localization of TNF-EGFP fusion proteins. A and B, HMC-1 cells were transfected with p1–76, p77–234, or p1–234hTNF-EGFP and lysed 24 h posttransfection; lysates were analyzed by Western blot using anti-GFP and anti-TNF primary Abs. C–E, HMC-1 cells were transfected with p1–76, p77–234, or p1–234hTNF-EGFP and imaged under a confocal microscope 24 h posttransfection. Representative confocal planes are presented. Bars, 5 μm. 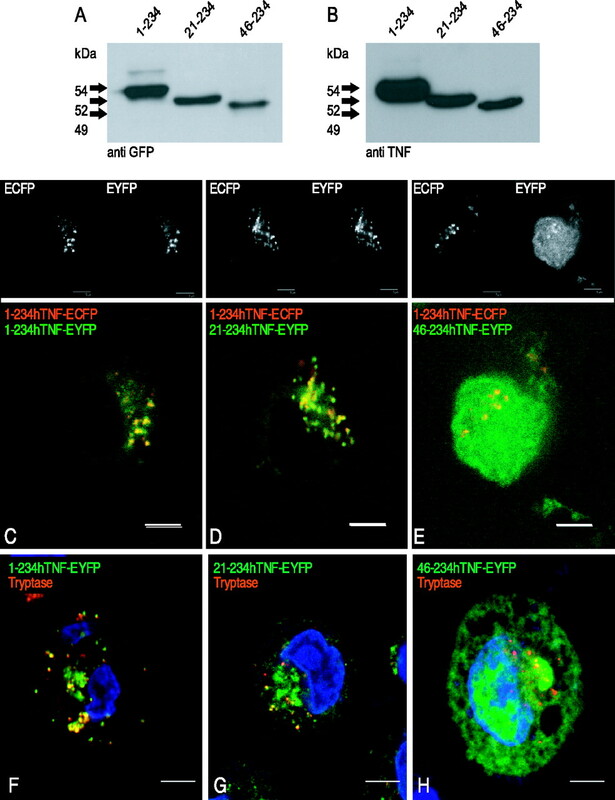 To establish whether fluorescent vesicular structures observed following transfection of mast cells with p1–76hTNF-EGFP and p1–234hTNF-EGFP indeed are mast cell granules, intracellular localization of the three fusion proteins and an established mast cell granule compound, tryptase, was compared. HMC-1 and LAD2 cells were transfected with p1–76hTNF-EGFP, p77–234 hTNF-EGFP, or p1–234hTNF-EGFP and 24 h after transfection were stained for tryptase. Cells expressing 1–76hTNF-EGFP exhibited vesicular patterns in both green and red fluorescence channels (EGFP and tryptase, respectively), but hardly any colocalization was observed (Fig. 3⇓, A and E for HMC-1 and LAD2, respectively). In cells transfected with p77–234hTNF-EGFP, mostly a diffuse pattern of fluorescence was observed in the EGFP channel, whereas tryptase stain revealed a vesicular pattern (Fig. 3⇓, B and F, for HMC-1 and LAD2, respectively). No specific colocalization of 77–234hTNF-EGFP and tryptase was observed in any of the cell lines. Transfection of cells with p1–234hTNF-EGFP resulted in accumulation of EGFP fluorescence in vesicular structures, most of which also stained positive for tryptase (Fig. 3⇓, C and G, for HMC-1 and LAD2, respectively), identifying the compartment as mast cell granules. 1–234hTNF-EGFP is sorted to and released from mast cell granules. A–C, HMC-1 cells and LAD2 cells (E–G) were transfected with p1–76, p77–234, or p1–234hTNF-EGFP (green channel) and 24 h posttransfection fixed and stained for tryptase (red channel). Yellow, Colocalization. For LAD2 cells, nuclei are visualized by TO-PRO3 stain (blue channel). Representative confocal planes are shown. Bars, 5 μm. D and H, ELISA of the TNF release from HMC-1 and LAD2 cells, respectively. Nontransfected cells (NT), cells transfected with p1–234hTNF-EGFP (1–234). Stimuli: nonstimulated (NS), PMA/ionomycin (PI), PMA/ionomycin/cycloheximide (PIC). Supernatants for analysis were collected 60 min following stimulation. For detailed description, see text. Differences in TNF release resulting from transfection or treatments, measured at the 1 h time point, were statistically significant. To test whether the function of granules is not disturbed by directing exogenously expressed TNF-EGFP fusion protein into this compartment, TNF release from stimulated mast cells was assessed. HMC-1 and LAD2 cells were transfected with p1–234hTNF-EGFP and cultured for 24 h; a subset of cells was then incubated with 20 μM CHX for 60 min. For TNF release, cells were incubated for 60 min in culture medium alone, in culture medium containing 100 ng/ml PMA and 1 μM ionomycin, or in culture medium containing both stimuli and 20 μM CHX (Fig. 3⇑, D and H). Nontransfected HMC-1 cells and cells expressing 1–234hTNF-EGFP, following treatment with PMA/ionomycin, released 176 and 841 pg of TNF/106 cells, respectively, as measured by ELISA. In the presence of PMA, ionomycin- and CHX-measured values were 22 and 402 pg of TNF/106 cells, respectively. Basal release from nonstimulated cells was 20 and 120 pg of TNF/106 cells for nontransfected and transfected cells, respectively (Fig. 3⇑D). The amounts of TNF released by HMC-1 cells within 30 min from stimulation, while not in all cases significantly different between transfection groups and treatments, fit the trend that is set by the statistically significant differences measured at 60 min of stimulation, thus supporting the presence of preformed cytokine in the cells (data not shown). Nontransfected LAD2 cells and cells expressing 1–234hTNF-EGFP, following treatment with PMA/ionomycin, released 27 and 747 pg of TNF/106 cells, respectively. In the presence of PMA, ionomycin- and CHX-measured values were 3 and 495 pg of TNF/106 cells. Basal release from nonstimulated cells was 2 and 27 pg of TNF/106 cells for nontransfected and transfected cells, respectively (Fig. 3⇑H). These results demonstrate that 1–234hTNF fusion protein is indeed sorted to, and released from, mast cell granules and raise the question of the trafficking route used for delivery of 1–234hTNF-EGFP to this compartment. In the absence of carbohydrate residues, TNF in HMC-1 cells might not be efficiently retrieved from the secretory pathway and, thus, become exposed on the cell membrane and eventually reinternalized for granule delivery. To test this hypothesis, HMC-1 cells were transfected with p1–234hTNF-EGFP and 12-h posttransfection surface proteins were biotinylated. Subsequently, cells were disrupted (control) or cultured for another 8 h and disrupted. Cellular organelles were separated by centrifugation on a Percoll gradient and β-hexosaminidase (granular enzyme) activity in these fractions was determined to localize the granule-containing fraction (Fig. 4⇓A). Additionally, biotinylated proteins were immunoprecipitated from fractions using streptavidin-Sepharose and analyzed by Western blot using anti-EGFP Abs. This allowed for detection of EGFP-containing proteins that were exposed on the outer membrane. In fractions obtained from cells disrupted directly after biotinylation, the majority of biotinylated, EGFP-containing protein was detected in light fractions (6, 7, 8) that represent cytosol and cell membrane. In fractions obtained from cells that were cultured for 8 h before disruption, the majority of this protein was found in fractions 1 and 2 containing heavier, β-hexosaminidase-containing organelles, including mast cell granules (Fig. 4⇓B). This indicates that during the 8-h chase period, 1–234hTNF-EGFP protein was translocated from the cell membrane into mast cell granules, though the mechanism of this translocation is not known. 1–234hTNF-EGFP is exposed on the outer membrane on the way to the granules. Cell surface of HMC-1 cells transfected with p1–234hTNF-EGFP was biotinylated 12 h posttransfection. 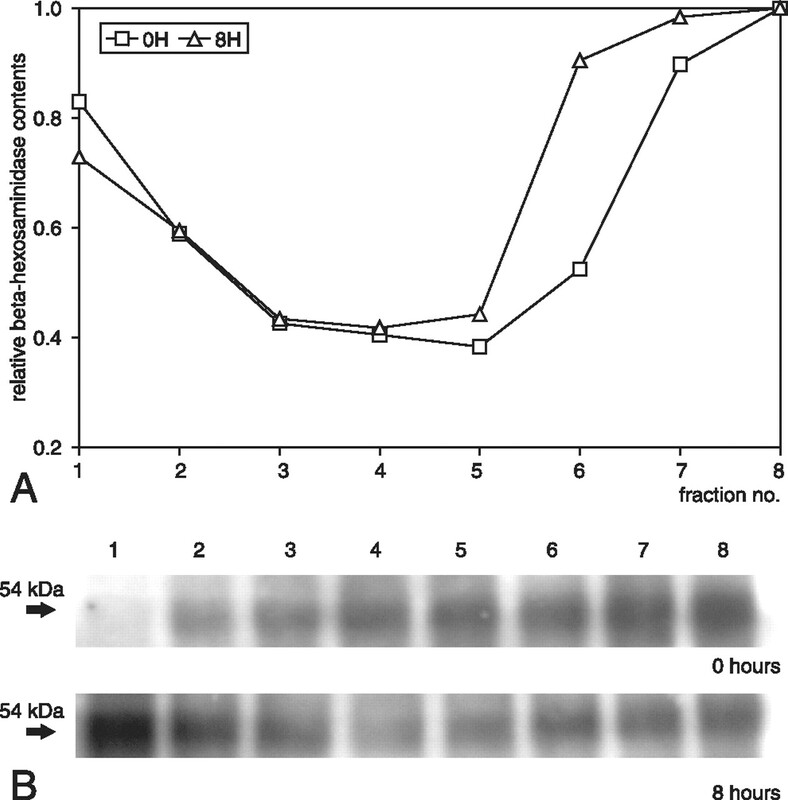 Cells were disrupted immediately (0H) or following an 8-h chase (8H) and subject to subcellular fractionation. A, β-hexosaminidase activity in fractions from heaviest (1) to lightest (8); granule-associated activity in fractions 1–2. B, Anti-GFP Western blot analysis of biotinylated proteins immunoprecipitated from fractions by streptavidin-agarose beads. We addressed the question of processes and amino acid motifs responsible for endocytosis and further trafficking of 1–234hTNF-EGFP to mast cell granules. Deletion mutants 21–234hTNF-EYFP and 46–234hTNF-EYFP were used to localize the region responsible for ER entry and granular targeting of TNF. Expression of 1-, 21-, and 46–234hTNF-EYFP was examined by transfection of HMC-1 cells with respective plasmids and Western blot analysis of lysates with the use of both anti-GFP and anti-TNF Abs. Both Abs detected proteins of apparent molecular masses of 54, 52, and 49 kDa in lysates of cells transfected with p1-, 21-, and 46–234hTNF-EYFP, respectively (Fig. 5⇓, A and B). To analyze intracellular localization of truncated mutant proteins HMC-1 cells were cotransfected with p1–234hTNF-ECFP, used as a granular marker, and p21–234hTNF-EYFP or p46–234hTNF-EYFP or p1–234hTNF-EYFP. Twenty-four hours posttransfection, cells were imaged under a confocal microscope. Both 21–234hTNF-EYFP and 1–234hTNF-EYFP exhibited a granular fluorescence pattern and colocalized with 1–234hTNF-ECFP in mast cell granules (Fig. 5⇓, C and D). In contrast, cells expressing 46–234hTNF-EYFP exhibited diffuse cytoplasmic and nuclear fluorescence with weakly fluorescent vesicles in the yellow channel and granular fluorescence in the cyan channel. Vesicular structures visible in the yellow channel colocalized well with 1–234hTNF-ECFP, which identified them as mast cell granules (Fig. 5⇓E). To ascertain these results, LAD2 cells were transfected with p1-, p21-, or p46–234hTNF-EYFP and at 24-h posttransfection were stained for tryptase. In cells transfected with p1–234hTNF-EYFP or p21–234hTNF-EYFP, a vesicular pattern of fluorescence was observed in the green channel (EYFP), which colocalized well with granules visualized by tryptase staining (red channel; Fig. 5⇓, F and G). Conversely, cells transfected with p46–234hTNF-EYFP exhibited diffuse cytoplasmic and nuclear patterns in the green channel with no specific colocalization observed between 46 and 234hTNF-EYFP and tryptase (Fig. 5⇓H). N-terminal domain is dispensable for granular targeting of TNF. A and B, Anti-GFP and anti-TNF Western blot analysis of lysates of HMC-1 cells transfected with p1-, 21-, or 46–234hTNF-EYFP. C–E, Confocal microscopy analysis of HMC-1 cells cotransfected with p1–234hTNF-ECFP and p1-, 21-, or 46–234hTNF-EYFP and imaged 24 h posttransfection. In overlay images, ECFP is represented by false color red and EYFP by false color green. Colocalization, Yellow. Representative confocal sections are shown. Bars, 5 μm. F–H, Confocal microscopy analysis of LAD2 cells transfected with p1-, 21-, or 46–234hTNF-EYFP and 24 h posttransfection stained for tryptase. In overlay images, EYFP is represented by false color green, tryptase stain by false color red, and nuclei are visualized by TO-PRO3 stain (blue channel). Colocalization of EYFP and tryptase is represented by yellow color. Representative confocal sections are shown. Bars, 5 μm. These data indicate that N-terminal 20 aa of TNF are dispensable for delivery of this protein to mast cell granules and that the 21–45 region of TNF is necessary for its efficient ER entry and subsequent trafficking. Mast cells’ ability to release N-terminal deletion mutants of TNF-EGFP upon stimulation was assayed. HMC-1 and LAD2 cells were transfected with p46–234hTNF-EGFP, p21–234hTNF-EGFP, or p1–234hTNF-EGFP and cultured for 24 h; a subset of cells was then incubated with 20 μM CHX for 60 min. For TNF release, cells were incubated in culture medium alone, in culture medium containing 100 ng/ml PMA and 1 μM ionomycin, or in culture medium containing both stimuli and 20 μM CHX. After 60 min of stimulation and/or inhibition, culture supernatants were collected and the TNF concentration was assayed. Results obtained for HMC-1 cells are shown in Fig. 6⇓A. Nontransfected cells, cells expressing 1–234hTNF-EGFP or 21–234hTNF-EGFP or 46–234hTNF-EGFP following treatment with PMA/ionomycin released 162, 854, 593, and 92 pg of TNF/106 cells, respectively. In the presence of PMA, ionomycin- and CHX-measured values were 17, 410, 262, and 9 pg of TNF/106 cells for respective transfectants. Basal release from nonstimulated cells was 16, 123, 59, and 6 pg of TNF/106 cells for nontransfected cells or for cells expressing 1–234hTNF-EGFP or 21–234hTNF-EGFP or 46–234hTNF-EGFP, respectively. The amounts of TNF released by HMC-1 cells within 30 min from stimulation, while not in all cases significantly different between transfection groups and treatments, fit the trend that is set by the statistically significant differences measured at 60 min of stimulation (data not shown). 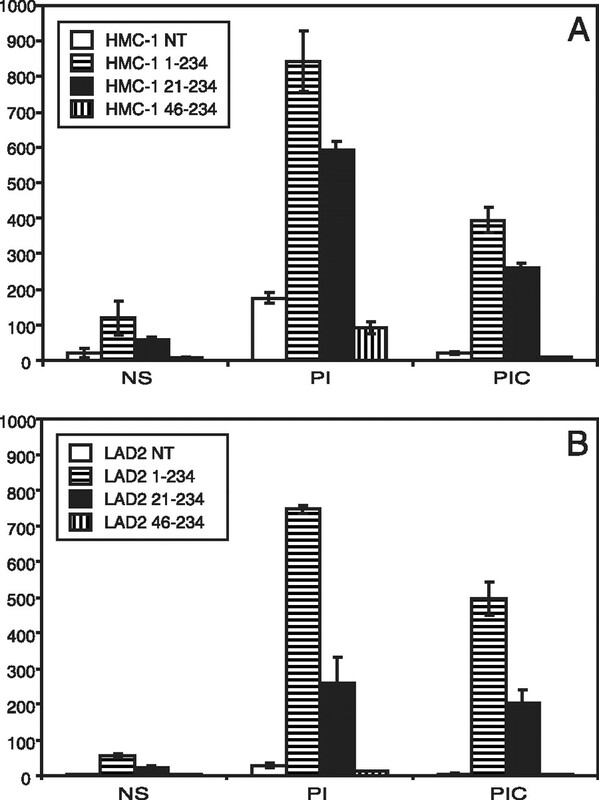 TNF concentrations measured in LAD2 culture supernatants are shown in Fig. 6⇓B. Nontransfected cells, cells expressing 1–234hTNF-EGFP or 21–234hTNF-EGFP, or 46–234hTNF-EGFP following treatment with PMA/ionomycin released 27, 747, 258, and 11 pg of TNF/106 cells, respectively. In the presence of PMA, ionomycin- and CHX-measured values were 3, 495, 203, and 3 pg of TNF/106 cells for respective transfectants. Basal release from nonstimulated cells was 2, 55, 22, and 3 pg of TNF/106 cells for nontransfected cells or cells expressing 1–234hTNF-EGFP, 21–234hTNF-EGFP, or 46–234hTNF-EGFP, respectively. 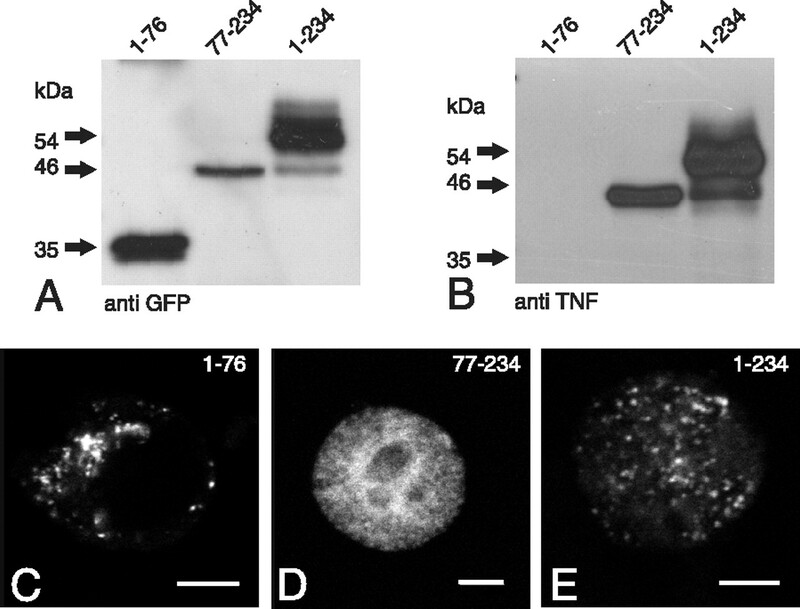 1- and 21–234, but not 46–234 TNF-GFP, are actively released from cells. ELISA of TNF release from HMC-1 (A) and LAD2 (B) cells. Nontransfected cells (NT), cells transfected with p1-, 21-, or 46–234hTNF-EGFP (1–234, 21–234, 46–234, respectively). Stimuli: nonstimulated (NS), PMA/ionomycin (PI), PMA/ionomycin/cycloheximide (PIC). Supernatants for TNF concentration measurements were collected from HMC-1 and LAD2 cultures 60 min poststimulation (A and B, respectively). For detailed description, see text. The differences in TNF release resulting from transfection or treatments, measured at the 1 h time point, were statistically significant. These data show that both 21–234hTNF-EGFP and 1– 234hTNF-EGFP are delivered to mast cell granules and released upon stimulation, although in the case of 21–234hTNF-EGFP this process is less efficient as compared with 1–234hTNF-EGFP. Among many cytokine-releasing cells, mast cells are the only ones known to store preformed TNF in their cytoplasmic granules and release it upon activation. Although intracellular trafficking, processing, and release of TNF were investigated in macrophages (26), the noticeable difference is that in mast cells there apparently exist mechanisms responsible for diverting TNF from the constitutive secretory pathway to mast cell granules. We have shown recently that, in rodent mast cells, TNF trafficking to cytoplasmic granules is dependent on N-linked glycosylation (10). This mechanism however does not seem to be evolutionarily conserved, because it is predominantly found in Rodentia, while in Artiodactyla N86 residue is replaced by alanine, which excludes any glycosylation. In contrast. 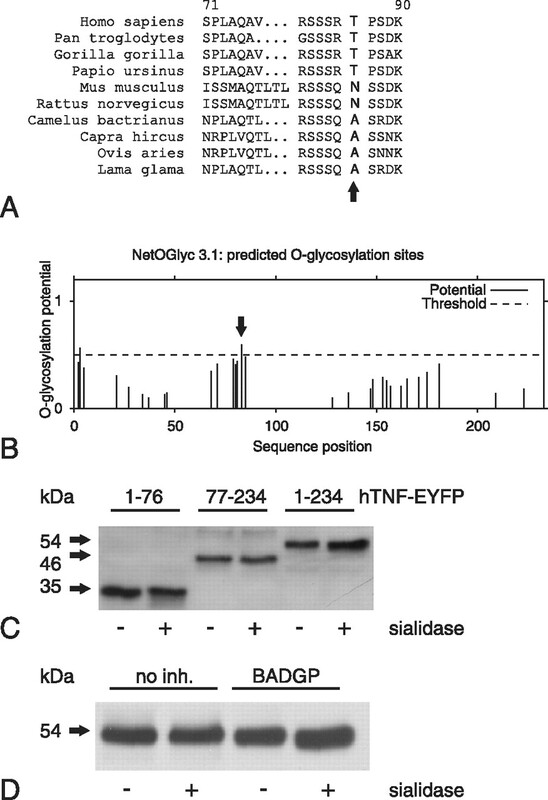 in primates the N-linked glycosylation motif is replaced by potential O-linked glycosylation site (Fig. 1⇑A). This posttranslational modification may also be involved in protein trafficking (25, 27) but its presence is more context-dependent than N-linked glycosylation. Neural network-based computer prediction (28) indicated that in human TNF T83 residue might be glycosylated (Fig. 1⇑B). Our results obtained by two different approaches suggest the opposite (Fig. 1⇑, C and D). It has to be noted, however, that posttranslational modifications may be cell lineage specific because O-glycosylation of TNF in the human B cell lymphoblastoid cell line BALL-1 has been reported (29). This might reflect involvement of differential, cell line-specific trafficking mechanisms in delivery of the protein cargo to the target compartment such as mast cell granules or in release to extracellular space. EGFP fusion proteins have been successfully used to follow intracellular trafficking of many proteins, including mast cell granular proteins CD63, VAMP-7, syntaxin-3, and phospholipase D (30, 31, 32, 33). In this work, we chose a similar strategy and transiently transfected the human mast cell lines HMC-1 or LAD2 with several TNF-EGFP fusion proteins to visualize intracellular trafficking of TNF in these cells. HMC-1 cells are often used as a model system for investigation of mast cell biology, including cytokine physiology (34, 35, 36). It has to be mentioned, however, that these cells lack several phenotypic features that are characteristic for normal human mast cells, including high-affinity IgE receptors (34) and, thus, conclusions concerning human mast cells have to be drawn with caution when this cell line is used as a research model. LAD2 is a recently developed cell line that closely resembles the primary culture of CD34+-derived human mast cells (23). Cell surface marker expression, enzyme contents, and functional FcεRI and FcγRI receptors make it a good model system for mast cell investigation; however, low growth rate, possibly allowing LAD2 cells to exhibit a more mature phenotype, precludes experiments requiring large amounts of cells, such as subcellular fractionation presented in Fig. 4⇑. The EGFP fused to full-length TNF, when expressed in both HMC-1 and LAD2 cells, accumulated predominantly in cytoplasmic granules, as visualized by colocalization with tryptase, a mast cell granular marker (Fig. 3⇑, C and G, respectively). This was not the case for fusion proteins consisting of either TNF propeptide or mature chain fused to EGFP (1–76hTNF-EGFP or 77–234hTNF-EGFP). The former produced a vesicular pattern, but organelles it accumulated in apparently are not mast cell granules, as shown by lack of significant colocalization with tryptase (Fig. 3⇑, A and E, respectively). This suggests that the protein enters ER, but due to lack of additional signals located in the mature chain it is missorted. Fusion protein consisting of the mature chain fused directly to EGFP exhibits a diffuse fluorescence pattern (Fig. 3⇑, B and F, respectively), which indicates that, in the absence of propeptide, ER entry is impaired and hypothesized granular targeting motifs cannot act. Observed differences in amounts of TNF released by nontransfected and p1–234hTNF-EGFP-transfected cells, even in the presence of CHX, suggest that the fusion protein is not only sorted to, but also efficiently released from, mast cell granules. Because human TNF expressed in HMC-1 cells apparently is not glycosylated, it cannot be retrieved from the secretory pathway by carbohydrate-dependent mechanism and might reach the outer membrane. We tested this hypothesis and showed that TNF is transiently exposed on the outer membrane, re-endocytosed, and ultimately delivered to mast cell granules (Fig. 4⇑). A protein that reaches the cell membrane can be re-endocytosed through the interactions of its cytoplasmic tail with a cytoplasmic protein (reviewed in Ref. 37), by an extracellular receptor (38), or passively with the membrane. Endocytosis of uncleaved TNF has been demonstrated in macrophages (39), and we addressed the question of molecular features involved in re-endocytosis of TNF leading to its storage in mast cell granules. Using EYFP fusion proteins, we have shown that truncation of the 20 N-terminal amino acids, constituting the majority of the cytoplasmic tail of TNF, does not interfere with its transport to mast cell granules (Fig. 5⇑, D and G). Contrarily, deletion of 45 N-terminal amino acids dramatically decreases TNF ER entry, although the fraction of 46–234hTNF-EGFP that is translocated into ER (only in HMC-1 cells) seems to be sorted to mast cell granules (Fig. 5⇑, E and H). This localizes an ER entry motif to the 21–45 region of TNF, which is in agreement with earlier data obtained in vitro (40). Sorting of 21–234hTNF-EYFP to mast cell granules suggests that TNF granular targeting is mediated by a mechanism that is operating on the outer side of the cell membrane, independently of the cytoplasmic tail of the cytokine. This is further supported by the observation that 1–76hTNF-EGFP is not sorted to granules, despite its complete cytoplasmic tail. It has to be noted, however, that the palmitoylation of human TNF on C30 has been reported (41) and a regulatory role for the lipid residue has been postulated with regard to endocytosis efficiency (42, 43). This reversible posttranslational modification could provide an additional level of regulation of TNF endocytosis and granule delivery rate. Functional characterization of the target compartment reached by 1-, 21-, and 46–234hTNF-EYFP as compared with endogenous TNF revealed that, upon stimulation in the presence of CHX, mast cells expressing 1- or 21–234hTNF-EYFP release significantly more TNF than cells that are nontransfected or transfected with 46–234hTNF-EYFP (Fig. 6⇑). These data indicate that, in the absence of the majority of its cytoplasmic tail TNF is still efficiently delivered to, stored in, and released from mast cell granules. In this study, we present data indicating that glycosylation is not necessary for efficient sorting and release of TNF from human mast cell granules. We also identify a new trafficking route of this cytokine in human mast cells, which involves transient exposure to extracellular space followed by endocytosis. The exact nature of this endocytotic mechanism is not known, but the data gathered suggest a mechanism involving recognition of the mature chain by a hypothetical receptor mediating delivery to granules. Based on the data presented in this study, it might be hypothesized that the regulatory mechanism diverting TNF from the constitutive secretory pathway to mast cell granules might be TNF cleavage dependent. Resting cells express low levels of TNF-converting enzyme (TACE) and uncleaved TNF is endocytosed and stored in mast cell granules. Following activation, TACE is induced and released into extracellular space (44, 45). Consequently, TNF is processed as it follows the secretory pathway and also during exposure on the cell membrane, which results in increased release into the environment. Further studies will be required to test the above hypothesis. Identification of the motif recognized in the TNF molecule by the granule-targeting endocytotic mechanism will be particularly important, because interference with the mechanism of TNF trafficking is of potential therapeutic relevance for mast cell-derived TNF-related diseases (Refs. 46 and 47 , and reviewed in Ref. 48). We thank A. G. van Ieperen-van Dijk (Department of Dermatology and Allergology, University Medical Center Utrecht (UMCU), Utrecht, The Netherlands). M. Buitenhuis (Department of Pulmonary Diseases, UMCU), D. F. van Wichen, and P. J. A. de Koning (Department of Pathology, UMCU) for excellent technical assistance and Prof. E. F. Potworowski (Institut National de la Recherche Scientifique), Institut Armand-Frappier, Quebec, Canada) and Dr. M. P. Klejman (International Institute of Molecular and Cell Biology, Warsaw, Poland) for critical reading of this manuscript. We acknowledge Profs. A. and M. Zylicz (Department of Molecular Biology, International Institute of Molecular and Cellular Biology) for providing access to confocal imaging facilities. ↵1 M.B.O. was supported by the European Commission 5th Framework Programme Project “Center of Excellence in Molecular Bio-Medicine Contract” QLK6-CT-2002-90363, EMBO short-term fellowship, and FEBS Collaborative Experimental Scholarship for Central and Eastern Europe. ↵3 Abbreviations used in this paper: sTNF, soluble form TNF; ER, endoplasmic reticulum; EGFP, enhanced GFP; ORF, open reading frame; CHX, cycloheximide; TACE, TNF-converting enzyme. Echtenacher, B., D. N. Mannel, L. Hultner. 1996. Critical protective role of mast cells in a model of acute septic peritonitis. Nature 381: 75-77. Malaviya, R., T. Ikeda, E. Ross, S. N. Abraham. 1996. Mast cell modulation of neutrophil influx and bacterial clearance at sites of infection through TNF-α. Nature 381: 77-80. Zhang, Y., B. F. Ramos, B. A. Jakschik. 1991. Augmentation of reverse Arthus reaction by mast cells in mice. J. Clin. Invest. 88: 841-846. Zhang, Y., B. F. Ramos, B. Jakschik, M. P. Baganoff, C. L. Deppeler, D. M. Meyer, D. L. Widomski, D. J. Fretland, M. A. Bolanowski. 1995. Interleukin 8 and mast cell-generated tumor necrosis factor-α in neutrophil recruitment. Inflammation 19: 119-132. Beil, W. J., G. R. Login, S. J. Galli, A. M. Dvorak. 1994. Ultrastructural immunogold localization of tumor necrosis factor-α to the cytoplasmic granules of rat peritoneal mast cells with rapid microwave fixation. J. Allergy Clin. Immunol. 94: 531-536. Beil, W. J., G. R. Login, M. Aoki, L. O. Lunardi, E. S. Morgan, S. J. Galli, A. M. Dvorak. 1996. Tumor necrosis factor α immunoreactivity of rat peritoneal mast cell granules decreases during early secretion induced by compound 48/80: an ultrastructural immunogold morphometric analysis. Int. Arch. Allergy Immunol. 109: 383-389. Decoster, E., B. Vanhaesebroeck, P. Vandenabeele, J. Grooten, W. Fiers. 1995. Generation and biological characterization of membrane-bound, uncleavable murine tumor necrosis factor. J. Biol. Chem. 270: 18473-18478. Baumgartner, R. A., K. Yamada, V. A. Deramo, M. A. Beaven. 1994. Secretion of TNF from a rat mast cell line is a brefeldin A-sensitive and a calcium/protein kinase C-regulated process. J. Immunol. 153: 2609-2617. Solomon, K. A., M. B. Covington, C. P. DeCicco, R. C. Newton. 1997. The fate of pro-TNF-α following inhibition of metalloprotease-dependent processing to soluble TNF-α in human monocytes. J. Immunol. 159: 4524-4531. Olszewski, M. B., D. Trzaska, E. F. Knol, V. Adamczewska, J. Dastych. 2006. Efficient sorting of TNF-α to rodent mast cell granules is dependent on N-linked glycosylation. Eur. J. Immunol. 36: 997-1008. Bradding, P., R. Mediwake, I. H. Feather, J. Madden, M. K. Church, S. T. Holgate, P. H. Howarth. 1995. TNF α is localized to nasal mucosal mast cells and is released in acute allergic rhinitis. Clin. Exp. Allergy 25: 406-415. Walsh, L. J., G. Trinchieri, H. A. Waldorf, D. Whitaker, G. F. Murphy. 1991. Human dermal mast cells contain and release tumor necrosis factor α, which induces endothelial leukocyte adhesion molecule 1. Proc. Natl. Acad. Sci. USA 88: 4220-4224. Beil, W. J., P. F. Weller, M. A. Peppercorn, S. J. Galli, A. M. Dvorak. 1995. Ultrastructural immunogold localization of subcellular sites of TNF-α in colonic Crohn’s disease. J. Leukocyte Biol. 58: 284-298. Kaartinen, M., A. Penttila, P. T. Kovanen. 1996. Mast cells in rupture-prone areas of human coronary atheromas produce and store TNF-α. Circulation 94: 2787-2792. Kelley, J. L., D. S. Chi, W. Abou-Auda, J. K. Smith, G. Krishnaswamy. 2000. The molecular role of mast cells in atherosclerotic cardiovascular disease. Mol. Med. Today 6: 304-308. Arock, M., E. Ross, R. Lai-Kuen, G. Averlant, Z. Gao, S. N. Abraham. 1998. Phagocytic and tumor necrosis factor α response of human mast cells following exposure to gram-negative and gram-positive bacteria. Infect. Immun. 66: 6030-6034. Artuc, M., B. Hermes, U. M. Steckelings, A. Grutzkau, B. M. Henz. 1999. Mast cells and their mediators in cutaneous wound healing: active participants or innocent bystanders?. Exp. Dermatol. 8: 1-16. Garbuzenko, E., A. Nagler, D. Pickholtz, P. Gillery, R. Reich, F. X. Maquart, F. Levi-Schaffer. 2002. Human mast cells stimulate fibroblast proliferation, collagen synthesis and lattice contraction: a direct role for mast cells in skin fibrosis. Clin. Exp. Allergy 32: 237-246. Woolley, D. E., L. C. Tetlow. 2000. Mast cell activation and its relation to proinflammatory cytokine production in the rheumatoid lesion. Arthritis Res. 2: 65-74. Lilja, I., C. Gustafson-Svard, L. Franzen, R. Sjodahl. 2000. Tumor necrosis factor-α in ileal mast cells in patients with Crohn’s disease. Digestion 61: 68-76.
de Vries, I. J., E. G. Langeveld-Wildschut, F. C. van Reijsen, G. R. Dubois, J. A. van den Hoek, I. C. Bihari, D. van Wichen, R. A. de Weger, E. F. Knol, T. Thepen, C. A. Bruijnzeel-Koomen. 1998. Adhesion molecule expression on skin endothelia in atopic dermatitis: effects of TNF-α and IL-4. J. Allergy Clin. Immunol. 102: 461-468. Butterfield, J. H., D. Weiler, G. Dewald, G. J. Gleich. 1988. Establishment of an immature mast cell line from a patient with mast cell leukemia. Leuk. Res. 12: 345-355. Kirshenbaum, A. S., C. Akin, Y. Wu, M. Rottem, J. P. Goff, M. A. Beaven, V. K. Rao, D. D. Metcalfe. 2003. Characterization of novel stem cell factor responsive human mast cell lines LAD 1 and 2 established from a patient with mast cell sarcoma/leukemia; activation following aggregation of FcεRI or FcγRI. Leuk. Res. 27: 677-682. Gullberg, U., A. Lindmark, E. Nilsson, A. M. Persson, I. Olsson. 1994. Processing of human cathepsin G after transfection to the rat basophilic/mast cell tumor line RBL. J. Biol. Chem. 269: 25219-25225. Huet, G., S. Hennebicq-Reig, C. de Bolos, F. Ulloa, T. Lesuffleur, A. Barbat, V. Carriere, I. Kim, F. X. Real, P. Delannoy, A. Zweibaum. 1998. GalNAc-α-O-benzyl inhibits NeuAcα2–3 glycosylation and blocks the intracellular transport of apical glycoproteins and mucus in differentiated HT-29 cells. J. Cell Biol. 141: 1311-1322. Shurety, W., A. Merino-Trigo, D. Brown, D. A. Hume, J. L. Stow. 2000. Localization and post-Golgi trafficking of tumor necrosis factor-α in macrophages. J. Interferon Cytokine Res. 20: 427-438. Kozarsky, K. F., S. M. Call, S. K. Dower, M. Krieger. 1988. Abnormal intracellular sorting of O-linked carbohydrate-deficient interleukin-2 receptors. Mol. Cell. Biol. 8: 3357-3363. Julenius, K., A. Molgaard, R. Gupta, S. Brunak. 2005. Prediction, conservation analysis, and structural characterization of mammalian mucin-type O-glycosylation sites. Glycobiology 15: 153-164. Takakura-Yamamoto, R., S. Yamamoto, S. Fukuda, M. Kurimoto. 1996. O-glycosylated species of natural human tumor-necrosis factor-α. Eur J. Biochem. 235: 431-437. Amano, T., T. Furuno, N. Hirashima, N. Ohyama, M. Nakanishi. 2001. Dynamics of intracellular granules with CD63-GFP in rat basophilic leukemia cells. J. Biochem. 129: 739-744. Brown, F. D., N. Thompson, K. M. Saqib, J. M. Clark, D. Powner, N. T. Thompson, R. Solari, M. J. Wakelam. 1998. Phospholipase D1 localises to secretory granules and lysosomes and is plasma-membrane translocated on cellular stimulation. Curr. Biol. 8: 835-838. Demo, S. D., E. Masuda, A. B. Rossi, B. T. Throndset, A. L. Gerard, E. H. Chan, R. J. Armstrong, B. P. Fox, J. B. Lorens, D. G. Payan, et al 1999. Quantitative measurement of mast cell degranulation using a novel flow cytometric annexin-V binding assay. Cytometry 36: 340-348. Hibi, T., N. Hirashima, M. Nakanishi. 2000. Rat basophilic leukemia cells express syntaxin-3 and VAMP-7 in granule membranes. Biochem. Biophys. Res. Commun. 271: 36-41. Nilsson, G., T. Blom, M. Kusche-Gullberg, L. Kjellen, J. H. Butterfield, C. Sundstrom, K. Nilsson, L. Hellman. 1994. Phenotypic characterization of the human mast-cell line HMC-1. Scand. J. Immunol. 39: 489-498. Zhao, Y., P. C. Leung, K. S. Woo, G. G. Chen, Y. O. Wong, S. X. Liu, C. A. van Hasselt. 2004. Inhibitory effects of budesonide, desloratadine and dexamethasone on cytokine release from human mast cell line (HMC-1). Inflamm. Res. 53: 664-669. Wierecky, J., J. Grabbe, H. H. Wolff, B. F. Gibbs. 2000. Cytokine release from a human mast cell line (HMC-1) in response to stimulation with anti-IgE and other secretagogues. Inflamm. Res. 49: (Suppl. 1):S7-S8. Bonifacino, J. S., L. M. Traub. 2003. Signals for sorting of transmembrane proteins to endosomes and lysosomes. Annu. Rev. Biochem. 72: 395-447. Higuchi, M., B. B. Aggarwal. 1994. TNF induces internalization of the p60 receptor and shedding of the p80 receptor. J. Immunol. 152: 3550-3558. Shurety, W., J. K. Pagan, J. B. Prins, J. L. Stow. 2001. Endocytosis of uncleaved tumor necrosis factor-α in macrophages. Lab. Invest. 81: 107-117. Utsumi, T., K. Akimaru, Z. Kawabata, A. Levitan, T. Tokunaga, P. Tang, A. Ide, M. C. Hung, J. Klostergaard. 1995. Human pro-tumor necrosis factor: molecular determinants of membrane translocation, sorting, and maturation. Mol. Cell. Biol. 15: 6398-6405. Utsumi, T., T. Takeshige, K. Tanaka, K. Takami, Y. Kira, J. Klostergaard, R. Ishisaka. 2001. Transmembrane TNF (pro-TNF) is palmitoylated. FEBS Lett. 500: 1-6. Alvarez, E., N. Girones, R. J. Davis. 1990. Inhibition of the receptor-mediated endocytosis of diferric transferrin is associated with the covalent modification of the transferrin receptor with palmitic acid. J. Biol. Chem. 265: 16644-16655. Kawate, N., K. M. Menon. 1994. Palmitoylation of luteinizing hormone/human choriogonadotropin receptors in transfected cells. Abolition of palmitoylation by mutation of Cys-621 and Cys-622 residues in the cytoplasmic tail increases ligand-induced internalization of the receptor. J. Biol. Chem. 269: 30651-30658. Zheng, Y., P. Saftig, D. Hartmann, C. Blobel. 2004. Evaluation of the contribution of different ADAMs to tumor necrosis factor α (TNFα) shedding and of the function of the TNFα ectodomain in ensuring selective stimulated shedding by the TNFα convertase (TACE/ADAM17). J. Biol. Chem. 279: 42898-42906. Walcheck, B., A. H. Herrera, C. St Hill, P. E. Mattila, A. R. Whitney, F. R. Deleo. 2006. ADAM17 activity during human neutrophil activation and apoptosis. Eur. J. Immunol. 36: 968-976. Robbie-Ryan, M., M. Brown. 2002. The role of mast cells in allergy and autoimmunity. Curr. Opin. Immunol. 14: 728-733. Tetlow, L. C., D. E. Woolley. 1995. Distribution, activation and tryptase/chymase phenotype of mast cells in the rheumatoid lesion. Ann. Rheum. Dis. 54: 549-555. Watanabe, N., B. Akikusa, S. Y. Park, H. Ohno, L. Fossati, G. Vecchietti, J. E. Gessner, R. E. Schmidt, J. S. Verbeek, B. Ryffel, et al 1999. Mast cells induce autoantibody-mediated vasculitis syndrome through tumor necrosis factor production upon triggering Fcγ receptors. Blood 94: 3855-3863.